Home Binary Options Should We Close Our Deep-In-The-Money Strike or Allow Assignment? Should We Close Our Deep-In-The-Money Strike or Allow Assignment? When our covered call positions end up moving deep in-the-money, we are faced with the decision to close as our maximum profit has been realized or take no action and allow assignment. In October 2017, Andrew shared with me a trade he successfully executed and was faced with such a dilemma. The question at hand is whether it is too expensive to close at $2.50…to close or not to close! The Ellman Calculator shows a total maximum return of 10.3% (2.8% + 7.5%). This 1-month return will be realized as long as share value remains above $30.00. In order to justify spending 2.93% to close, we must be able to say that investing the proceeds from the sale of the stock will result in a return at least 1% higher then 2.93%. With only 8 trading days remaining until contract expiration, this is highly unlikely. As long as share value does not decline by more than 5.4% ($1.62/$30.00) in the next 8 trading days, we will have realized our maximum 10.3%, 1-month return. Many times, the best action is no action at all. If share value continues to rise and the time value cost-to-close approaches zero, we can re-evaluate and possibly take action. As expiration Friday approaches, we can also evaluate for possibly rolling our options. When share price accelerates substantially and we cannot benefit any more from share appreciation positions can be closed based on the time value cost-to-close. We will spend the money if the cash generated from selling the underlying can generate a higher return than the cost-to-close by at least 1%. For a free copy of the Basic Ellman Calculator (does not include the “unwind now” tab) , click here. The Elite version of the Ellman Calculator is available for sale in the Blue Collar store and free to premium members in the “resources/downloads” section of the member site. Login to your member site to view this webinar. All webinars are available and free to premium and video members only. BCI: Selling 2 in-the-money strikes for every 1 out-of-the-money strike for all new positions. Earnings season is solid so far. The 6-month charts point to a bearish sentiment. In the past six months, the S&P 500 was up 2% while the VIX (15.40) moved up by 50%. The VIX has subsided a bit more from the last week. 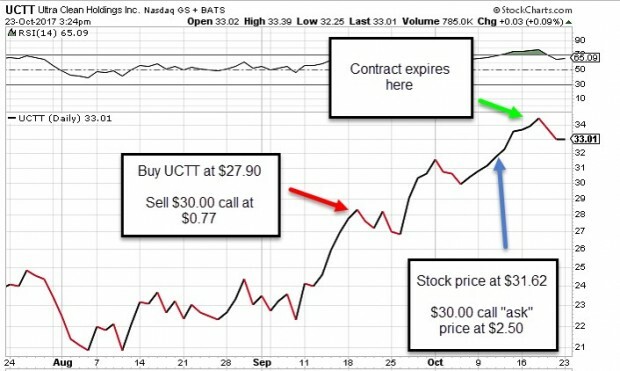 Previous articleWhat Contract Month & Option Strike Price Should I Buy Or Sell?